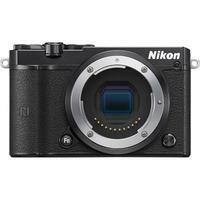 The Nikon 1 J5 adds to Nikon's range of compact interchangeable lens cameras boasting a new back-illuminated CX-format sensor and latest EXPEED 5A processor to capture stunning 20.8-megapixel stills, ultra-sharp 4K video footage and smooth time-lapse movies. The J5 delivers 20 fps in continuous AF and 60 fps with the focus fixed thanks to the quick hybrid autofocus (AF) system that uses 171 AF points to rapidly lock onto your subject, instantly switching between 105 phase-detection AF points and contrast-detect AF. The camera's ergonomic DSLR-style layout, 3.0" tiltable touchscreen and built-in Wi-Fi with NFC connectivity brings both creative and manual control straight to your fingertips to ensure you and your friends never miss a moment.